MEET JUAN! Juan is a native of the Peruvian Amazon who lives in the rainforest. 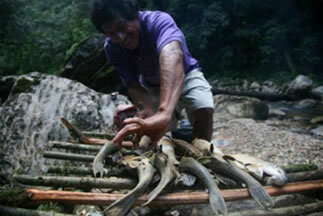 As many others in his community, he sustains his family by catching fish, but that's often not enough. He could find other sources of income as a guide and help tourists to discover all the wonderful places in the region, however, he would be more prepared for these activities if he could speak other languages or communicate with travel agencies through the web. NetPartners is committed to people like Juan, and part of the firm's profits are designated to social services. Juan was given training in the use of computers and the internet as well as given funding for languages studies. We realize that being Socially Responsible means to support our communities in Latin America.